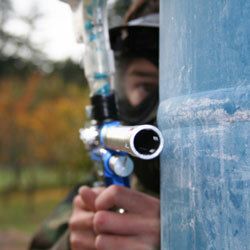 Two days after my 10th birthday, I was invited to my good friend’s paintball birthday party. The equipment was complete junk. There was absolutely no body protection, only a jumpsuit to stop the paint (which was adult-sized) and a mask (way too big for children). At the end of round two, a boy from the other team crept around our “base”, and shot me in the mouth guard. As I got up to go out (that was the rule), he shot me again, this time under the mask. The mask kept falling off; even with the strap at it’s tightest. The paintball hit me directly in the right eye (It was only going ~150 km/h!!!). it hurt! For a few seconds all I could hear was me screaming for help. My eye was hemorrhaging; I was rushed to The Montreal Children’s Hospital. I stayed there, almost immobile, for 11 days because my eye was severely damaged. 2. Do you have any residual problems from the trauma and what impact does it have on school, sports, etc? I have many residual problems such as permanent blurry vision in my injured eye, less feeling in my eye, and a high risk of glaucoma. If I ever get hit again I will loose my eye. My pupil (the black dot/circle in your eye) is permanently longer, a bit like a cat’s. I cannot play contact sports, such as football, soccer, hockey, basketball. I must also wear protective eyewear when I do play a sport. I can never be outside without sun glasses as I cannot see if there is any glare or sun…I also need to use anti-inflammatory drops every day which burns my eye. 3. Do you have a message for other kids and teens? Yes. Do not play paintball !!! It is a dangerous game and the equipment is not safe enough for kids. I am excluded from so many things. Within a split second my perfect vision was destroyed and my life changed. Don’t let this happen to you!! !